Spring, summer and fall maintenance are critical for a healthy pond. Return your pumps to the water after careful inspection of them and your hoses. You can give your biological filters a spring boost by inoculating them with beneficial bacteria available from garden suppliers. These help to jump start your pond and maintain a healthy immune system for your fish. Make sure you are using the correct one for your water temperature. Test the water to assure that ammonia has not built up over the winter months. If you have high levels of ammonia, a 25% water exchange at this time should reduce the risk to your fish. If a greater amount of water exchange is required, you will have to remove your fish. If you have chlorine in the water, you will need to treat it. Be patient if you notice string algae or green water. Once your pond has established a balance this will disappear. Remove your plants and trim or pinch the old growth and all yellowing leaves off. Divide and repot these plants. 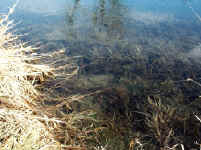 Give tadpoles, dragonfly larvae and other pond inhabitants time to escape before placing the trimmings on a compost pile. Fertilize your plants with fish-safe fertilizer pellets to help give the plants a jump-start on the season. Remove all leaves and debris that may have blown in during the winter. A fine-mesh, long-handled swimming pool skimmer net is perfect for this job. The removal of this debris will remove potential sources of ammonia, nitrites and nitrates from your water, which is also toxic to fish. Place your plants at their appropriate depths or set in shallow water to encourage quicker growth and then placing them at the depth you want them to be. Replace your fish once the water has been treated, and sprinkle "Sea Salt" around the perimeter of the pond. This will give your fish a good slime coat that will help protect them from diseases. Fish may be coming to the surface looking for food, but you should not feed your fish until the water temperature reaches 50 degrees F. Start them out with something like plain cereal (e.g. Cheerios) or something that can be easily digested. Wheat-germ-based floating pellets are a good source of food for your fish at this time. Feed them in the morning so that they have ample time to digest their food before the night turns cool. Keep a watch for parasites and disease in your fish. Green water is caused by an exploding population of free-floating, single-celled algae. This is the first step in a natural process that establishes a healthy, balanced ecosystem. This should clear up naturally within 4 - 6 weeks as the plants start to take over. Your pond has to build up beneficial bacteria. You can also add this bacteria yourself to help speed up the process. Short, mossy algae that looks like fuzzy hair and grows on rocks and on pots is good. It indicates that the wastes in the pond are properly being broken down and nitrates are being made. This fuzzy algae is working like submergible plants. They keep ponds clear by removing excess nutrients from the water preventing the pea-soup algae that turns your pond green. Some people like to scrub this off their rocks or pots - but you should try to work with Mother Nature not against her. This fuzzy algae also gives the fish something to eat when you're not around to feed them. DO NOT DRAIN YOUR POND. Mother Nature takes her time to work. If you drain your pond you will have to start all over again. Leave the fuzzy stuff. Now the stringy stuff. Until your water plants put out enough growth to remove the nutrients from the water that feed this, use a toilet brush to remove it. Algae needs sunlight to grow. Keeping your water covered 60% to 65% with plants will help shade your pond or you can use a water dye. Using a dye during the winter will darken your water and keep the winter and early spring sun from giving you an early growth of algae. The dye will dissipate by spring. There are products available that are dissolved in water and added to the pond in the early spring when the water temperature is below 55°. If you don't like to remove this string algae you can use a UV sterilizer to kill it. A UV Sterilizer uses ultraviolet light to kill algae and fish pathogens that are free-floating in the water. Do keep the string algae from wrapping around tender young plants, they can strangle and kill plants. Heavy concentration can also suffocate plants or deprive them of necessary sunlight. Better yet, try barley products! We all know Barley helps us keep that fuzzy, stringy, bubbly unsightly stuff from growing in our Pond. The trouble is those, almost equally unsightly, Barley Bales floating around in the Pond. There is a better way: Put some Barley Pellets in the Pond Filter! They are small enough to be put into any kind of Pond Filter: submersible, pressurized or waterfall Filters. Works like a charm and also helps to gradually reduce frequency of Filter cleaning. Do not wait for all the them to decompose, add a handful of new pellets every week or so to keep effective beneficial enzyme production at a constant level. Summer is the time to keep your strainers and skimmers clean. Keep adding fresh water to your pond because the hotter weather will cause water to evaporate. Monitor all pond life carefully for diseases and parasites. Treat as needed. Feed your fish at least twice a day. Only feed them as much as they can eat in 5 minutes. It is best to under feed than over feed them. Give them different foods like, lettuce, watermelon, grapefruit, and anything else that they might like. If you buy new fish, quarantine them for at least 21 days before you release them into your pond with other fish. Quarantine new plants for 14 days before you add them. They could have been kept in a pond with diseased fish and still be harboring disease agents. A final rinse under the tap should prevent anything still attached to them from getting into your pond. Continue fertilizing your plants through August. Run your pump continuously. Aquatic plants add oxygen during the day but remove it from the water at night. Don't feed your fish if the temperatures goes over 85°. If the water stays over 85° for several days, you may want to add fresh water to cool it down. Do not do more than 25% exchange. Do not have an overstocked pond. Too many fish means too little oxygen. When signs of autumn are springing up everywhere it's time to prepare your pond for winter. 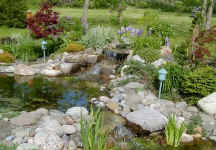 Transplanting and dividing of your pond plants should be left until spring. 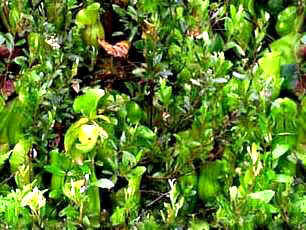 Remove all fading foliage from marginal plants after the first frost. In areas where the water lily beetle is prevalent, they love nothing better than the dying foliage of your marginal plants where they can hide for the winter. Remove and bring indoors your tropical marginal plants before the first frost. To protect your hardy water plants, lower them to the bottom of your pond. Install a protective net over the pond if you have a lot of falling leaves. Plastic bird netting is available at most garden centers. You can insert a stick or garden rake into a potted plant to give your net a higher point, like a tent. This will allow the leaves to be swept from the net. Do not allow the net to drape into your pond. Fish and frogs can become entangled in the net. Remove the leaves regularly from both pond and net. Keep them picked up from your yard so that the wind does not blow them in the pond. Repair any damages and leaks before winter. Reseed your biofilters with bacteria. This will help maintain good water quality during fall - use the type for winterization of your pond that works in water temperature under 55°F. It will help to decompose the leaves, scum, sediment, and other organic matter during fall and winter. These are natural, nontoxic and nonpathogenic and contain psychrophilic which is a cold weather bacteria. You can purchase this at almost any nursery that sells pond supplies. Remove all dead leaves and such from your pond. If you have a skimmer you will want to clean it at least once day to prevent blockage. Start feeding your fish food that is higher in carbohydrates and lower in protein. Carbohydrates will fatten your fish up for the long winter. Your fish do not hibernate during the winter. Their metabolism slows down as the water-cools down. If we fatten them up before we quit feeding them they will have enough to live on through the cold winter months. Start feeding your fish only once a day until the water temperature stabilizes below 55°. DO NOT FEED THEM AGAIN UNTIL SPRING WHEN THE WATER TEMPERATURE WARMS UP ABOVE THAT POINT. Even there are have some warm days during winter, do not feed. Now your fish do not have the cover of the plants to hide from predators. Keep an eye open. The herons can still get to your fish through a net. Try some fishing line around your pond, about six inches from the ground. Crisscross the line across your pond also. A milk carton, large planter turned upside down with a hole in the side, drainage pipes or anything else that your fish can hide in will protect them from raccoons and other predators. Make sure there aren't any rough edges for your fish to cut themselves on. You can also use a liquid shade to darken your pond. This will also keep the burst of algae down in the sunny winter days and early spring. Clean your filters and store any pumps or equipment you won't use during the winter. Remember to store oil-encapsulated pumps in a bucket of water that won't freeze to keep their seals from drying out. Place your de-icer or bubblers in the pond. 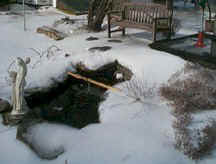 Whatever method you use, remember to always keep an opening in the ice (pond) so that the gases can escape. Your fish will survive in as little as 18 inches of water as long as it does not freeze solid.